That movie is “Leave No Trace,” an astonishingly powerful triumph that, like “Winter’s Bone,” centers on the fractured relationship between a self-sufficient young woman and her damaged father. Ben Foster is quietly wrenching as Will, a war veteran wracked with PTSD who decides to raise his daughter, Tom, in the wilderness. The strength of their bond endures until the modern world comes crashing upon them, forcing the pair to reevaluate what direction they want to take in life, and whether it will be the same one. McKenzie’s performance as the loving yet increasingly conflicted daughter is among the very best I’ve seen, and when it was announced that she would be attending the upcoming screening of “Leave No Trace” at KVIFF, an interview with her instantly rose to the top of my priority list. The next several paragraphs are an edited transcript of my conversation with McKenzie. In addition to “Leave No Trace,” we discussed her award-winning web series, “Lucy Lewis Can’t Lose,” the genius of Waititi and the experience that fueled her desire to perform. Your family has an impressive history in theatre, film and television, but how did you come to acting on your own terms? I have been surrounded by acting my whole life and it became kind of the norm for me to be around sets and other actors and directors, while gaining all this knowledge about the film industry. I just got so sick of it in the beginning that I did not want to be a part of it. But then I did the film “Consent,” about a lady called Louise Nicholas. She’s an amazing New Zealand woman who’s an incredibly strong female character, and her story about the abuse of power in the police force is true. She was raped by a group of policemen from when she was 13 up until her young adult life. The film is about her struggle of living with what happened to her and not knowing what to do with it, not knowing how to tell people. She’s so ashamed even though she shouldn’t be because it wasn’t her fault. You also see her struggling through the court system while people accuse her of lying. I played the young Louise, and there were some really intense and scary scenes that I had to do. That experience made me realize how, through acting, I have an opportunity to make a difference. I realized that acting was what I wanted to do, not because of the fame side of it, but because of the reward at the end of knowing that you put a really important story out into the world. Of course, I’m a teenager and that whole stardom idea is tempting and exciting, but it’s not what acting is about. I love the sort of naturalistic acting where you are being really true to the character. That’s how you connect with people and make them feel like they can relate to the story. Because she is a girl with a disability, she’s obviously had to deal with people knowing about it and making her feel a bit “different” or “special.” But it’s so awesome to see her stand up for herself and not care about the fact that she’s got a disability. She’s just another normal teenage kid who says what she believes in, even though she’s terrified of public speaking. There’s so much bullying and peer pressure in high schools, and I love that Lucy fights for what she believes in, against the wishes of her crazy, mean principal, who is played by my mom. [laughs] I’m usually watching her coach other actors, so it’s fun acting with her and she helps me a lot. The most important theme of the show is that a generation of young people, represented by Lucy, are speaking up for what they think is right. You see their spirit embodied in America by the Parkland students. Yeah! It’s actually really timely, with all of this happening now. There’s an entire section of KVIFF devoted to films about people with disabilities, and that need for representation appears to have been crucial in the development of this series. Yes it was. None of the kids look the same. They aren’t all skinny, white and stereotypically attractive. It’s just a mix of kids—big, small, dark-skinned, on crutches, in a wheelchair—just a range of people rather than the usual ones you see onscreen. Her revolt against the sexism of her school uniform is also a joy to watch. It’s true that those uniforms are sexist. I had to wear a pencil skirt for my own school uniform and it’s just horrible. I couldn’t bound up the stairs or cross my legs or anything, and it was so uncomfortable, whereas guys were allowed to wear normal clothes—shorts and pants. In my normal everyday life, I am mostly wearing jeans, so it’s not fair. It’s like we, as women, are made to feel more aware of our legs in these stupid skirts. On the other hand, one of the nice things about being a girl at fancy events is that you have a bigger range of colors and styles to choose from. 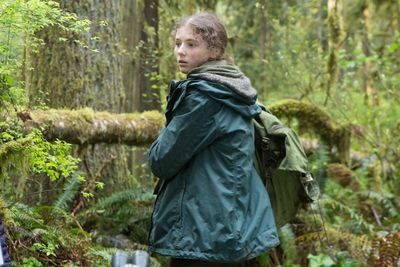 Were you able to choose some of your costumes in “Leave No Trace”? Yeah, Debra was so collaborative. When I was trying on various outfits, she’d ask me if I liked them and a lot of times, she’d let me decide what Tom would wear. Everyone’s ideas were welcome onset. It wasn’t like a big blockbuster movie where so much is happening at once. We were all just there in the moment, and the crew was so focused and lovely and talented. It felt like a family. No, she’s not that kind of director at all. I don’t remember her ever shouting, and she may never have even said, “Action,” honestly. Debra has often been asked why it has taken so long for her to make another movie after “Winter’s Bone,” and the truth is, she’s been doing many other things, such as making documentaries. But she’s also not the sort of person who will rush into a project if she doesn’t feel super-strongly about it. I think that’s why her movies are so good. A lot of thought has been put into them. As a viewer, one can sense the history of Will and Tom’s bond that existed long before the film begins. How did you and Ben go about forging that relationship? There was a rehearsal period that lasted about two weeks. The first day Ben and I met was also our first day of wilderness training, where we worked with survivalists. They taught us about birds and mushrooms and knives and how to make a fire or a salad out of things that would be in the forest. We learned all of that together, and I think it really was a bonding experience. We used a technique that my mom taught me called “hug to connect,” where you hug each other for a minute before the scene to feel comfortable in each other’s presence. It’s like the Maori greeting known as the Hongi, where you touch noses and share each other’s breath. Ben and I never delved into the history of Will’s character because Tom doesn’t really know that much about her dad’s past—his time in the army or his PTSD—so that whole history was actually unfamiliar to me as well. But as the story goes on, Tom starts to learn more about her dad. All that’s really important is the personal past Tom shares with Will. They are the only people that each other has, so it was important for Ben and my relationship to be close and intimate and for us to feel comfortable around each other, and we really, really did. I had a lot of trust in Ben. He’s such a talented actor and I learned a lot from just watching his mind work. He was expecting his first baby while we were filming, and I was thinking about my dad the whole time, who I was really missing because he wasn’t there with me during production. We were both thinking about our actual lives. Ben’s baby was born since then and her name is Ella Rose. She’s so cute. I saw Ben in a trailer not that long ago. I can’t remember what it was for and I didn’t know that he was in it. This was after I had filmed “Leave No Trace,” by the way. As I was watched the trailer, I kept seeing this guy, and I was like, “He looks so familiar … ” When it ended, I looked up the cast, and saw that the guy was Ben Foster. I was like, “How did I not know it was him?” [laughs] He just transforms into a completely different person. I couldn’t put my finger on who he was. What was that experience like of researching survivalist communities? It was so fun, it didn’t even feel like a rehearsal. We were just learning and one of my favorite things about acting as is the learning that occurs when you prepare for a role. You just learn so much. It was such an awesome experience learning about bird language and how you can read the birds and what they can tell you about what’s going on in the forest—if there’s an intruder or a dog walking by. For people who are stuck in the wilderness, it is so important to know how to make fires. It was on my first day of wilderness training that I was instructed to take sticks and rub them really fast, and I was so determined to make a fire that way. Our trainer, Nicole Apelian, told me that if I had gone for five more seconds, I would’ve had the fire, but my hands had so many blisters and I was in so much pain that I couldn’t go any longer. I also got to work with a beekeeper, and we actually shot the scene at her house where I’m holding the bees in my bare hands. It was so cool standing in front of the hive and smelling the honey. The sweetness and the warmth that’s coming at you and the sound of all the bees is so incredible. What was the origin of the tongue-clicking that you and Ben use to discreetly communicate? I think that came about during our rehearsals. It allowed Will and Tom to understand each other without having to say a word. The clicking was a way for them to check in and ask, “Are you okay?”, or, “Are you there?” Instead of vocalizing the words, they just made a little clicking sound. In the wilderness training course, we were quite focused on the ways people keep quiet in order to go undetected when in hiding. One of the reasons why your performance is so powerful is that you manage to convey the depths of Tom’s emotions while keeping them check, such as when she is separated from her father. Debra wanted that moment to be really drawn back, and of course I did it that way, because she’s the director. [laughs] But I also asked her if we could film an optional take where I break down crying, and we shot it, though it didn’t end up in the actual film. I’m glad Debra chose the one where I’m not overly emotional. Tom’s feelings are drawn back because she’s really vulnerable in that moment. She doesn’t want to give in to that emotion when she’s in front of a group of strangers. And she also doesn’t want her dad to feel that she would be lost without him. Tom chooses to be strong. The scene where she first starts to pull away from her dad is equally heartrending. It sounds funny but I really like doing emotional scenes. That moment was Tom’s first vocal indication that she and Will weren’t getting on the same page anymore. I thought that was quite an emotional scene because it starts that whole brokenness between them. I actually was getting really emotional and crying while filming many scenes in “Leave No Trace,” because just the thought of leaving my dad—maybe forever or maybe not, we don’t know—and having to go on a different path was so sad. When people think of the New Zealand film industry, their minds tend to go immediately to “The Hobbit” and Peter Jackson, because he’s definitely a leader. But in recent years, there have been some really beautiful films coming out of the industry, including the one that my dad and mom directed, “The Changeover.” “White Lies” is another beautiful film, as are Taika Waititi’s “Boy,” “Hunt for the Widerpeople” and “What We Do in the Shadows.” They aren’t massive blockbusters, and they each have something about them that is really personal and intimate. Don’t tell him I told you this, but I genuinely think Taika is a genius. He’s got the whole film in his head and he knows how he wants it to go. He’s got such a funny sense of humor that is never forced. The topic of his new film, “Jojo Rabbit,” that we’re filming now, is World War II, the Holocaust and the relationship between the Jews and the Nazis. It’s such a horrible time in history, and yet Taika allows the humor in the movie to come from the characters being themselves. He doesn’t force a joke. Could see yourself one day writing and directing? I’m at my happiest when I’m acting. At the beginning of this year, I was having a bunch of meetings with different agencies and they were talking about other opportunities I have with starting projects and producing and directing. These would obviously come further down the line if it all works out, you never know. I would love to help write something or produce something or start up a story. It’s all really exciting. I wasn’t onset the whole time when mom and dad made “The Changeover,” but I think people in New Zealand were really impressed that they were able to do it without getting into wars with each other. Co-directing is a hard thing to do, especially if you’re in such a tight-knit relationship. I love the film and am very proud of what they created. It was my first time watching the film on the big screen. I was so nervous! But we had a really amazing driver. Right before the premiere, he took us on a drive around Park City that helped me calm down. We listened to "3 Rounds and a Sound" by Blind Pilot, which is a key song for me now. The response of the audience was the best part of it for me. It was a big crowd and it was so amazing to hear them gasp or cry or laugh, sometimes in really unexpected moments. There’s a scene where Tom secretly hides her seahorse necklace by covering it with dirt. I improvised that in the moment because I figured that’s what I would’ve done, and it got a big laugh. I was so happy.